This week, Jenny is taking a day off. But we know a Monday with no Jenny would be a very sad day indeed, so we tracked down our favorite Jenny recipe. 1. Live in Southern California. This step is important. 2. Go to the farmer's market. 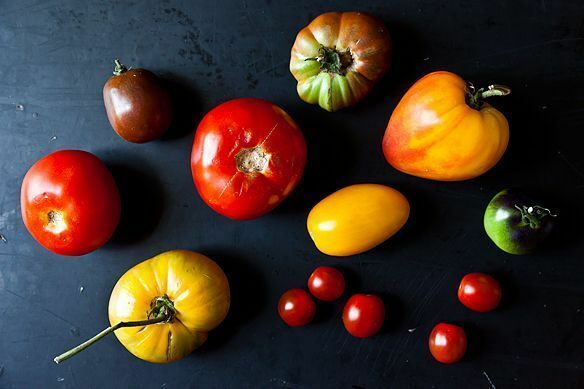 Pass the $5-a-lb heirloom tomato lady several times. Do nothing. As you are about to leave, approach her table, dig around in your pocket for the last time, place two tomatoes on her scale, then fork over your last $10, $3 of it in change. Go home. Lie to your spouse about how much they cost. Place salt on a nice piece of china. Cut up tomatoes, dip them in the salt and eat them. Regret nothing. Really? $5 a pound?? OMG Well I just saw them at Kroger for $5/lb and I thought that was outrageous but I may have to splurge. Moving to SoCal may be the problem. I wrote this when I lived in Los Angeles so I definitely had a bias. I like my DC heirlooms just as much; so yes you are all correct about that. Precisely the way I feel about heirloom tomatoes! They are worth every penny and I never suffer from buyers remorse. This EXACT scenario happened to me yesterday. & I made comment to my boyfriend that they were the best tomatoes I've ever had in my life to date. Decidedly NOT limited to So Cal. There are many wonderful farmers markets here in Chicago. Heck, I have a community garden plot and I am growing 10 different tomato varieties! You can grow good tomatoes almost anywhere except maybe the antipodes. Really good soil matters. So yes, even though I live in California, yeah they grow great tomatoes in Indiana and Illinois. But it's more than just the seeds. I think the best tomatoes on the planet come from the area around Napoli---even though the tomato is a New World fruit. You can take the seeds but you can't replicate the volcanic soil. I'm wondering if anyone has experimented with tomatoes on the "Big Island" of Hawaii. It would seem to have all the factors going, heat, humidity, volcano. Why do you need to live in socal? I'm in New York and have gorgeous heirlooms growing on my deck. Am I crazy in thinking that $5/lb isn't all that high for fresh, gorgeous & delicious heirlooms? The only way to eat tomatoes. Wow, I remember way back when this was broadcast on NPR. I think it was Evan Kleimann's show.